The US is said to be reaching our debt ceiling limit on October 17, 2013 and the October 18th Lunar Eclipse, a Full Moon of culmination, is close enough to be used as a timer for this critical condition especially if the limit isn't raised and a default by the US government occurs. However, a continuing resolution may intervene and 'kick the can down the road', as they say in Washington, so I've chosen to primarily focus this article on the Obamacare situation with a brief nod toward the US economy. As you see in this image, the Lunar Eclipse of October 18, 2013 perfects at 7:37:39 pm edt in Washington DC during a Solar Hour and across the 6/12 victim-savior axis. , and a sign of business, home, and security interests. Cold Saturn continues its trod through business-oriented Scorpio where Mr. Austerity can be obstinate, tenacious, secretive, and probing as he attempts to hold onto the past and the status quo. In progress, SP Venus also conjoins our SP Part of Fortune yet SP Chiron, The Wound, is also posited in SP 8th house @17Ari23. I think most people agree that America has been wounded in the financial arena in recent decades in order to bolster the wealth of a select few who are corrupt enough to make the 'Big Picture' happen. If only plutocratic politicians and their weasely corporate backers would get out of the way of Chiron's healing function! Some regions are already reporting delays due to computer glitches or other problems, though of course any new law that establishes such a massive program will obviously have its problems and with the October 18th Lunar Eclipse Moon posited in the 12th house of Large Institutions such as Hospitals, the Sun is in the 6th house of Health, Service, and Work--along with 'signing-up' Mercury in regenerating Scorpio and associated in the Greek era with the Rod of Aesclapius, or Aesculapia--so we may expect a few revelations to be spotlighted concerning the 6/12 departments of life which will include Politics and Back Room Deals (12th house) as well as health concerns. 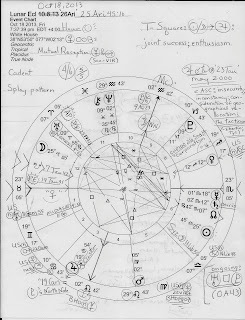 Of interest is the position of asteroid Aesculapia at the moment of the Lunar Eclipse: 6Gem07 Rx, rising and near US natal Uranus which possibly denotes the coming of a new phase in health care once the two conjoin, and a contact soon with Midas, the gold-hoarder, which you see here penned into the 1st house @9Gem51, Rx, and parallel planet Jupiter. A parallel is similar to a conjunction and is handy as a timing device. Another health-related asteroid and myth, Hygeia--a goddess actually--has risen already @10Tau08 Rx so is not very noticeable in 12th house of Hospitals between the South Node and the current Solar Eclipse degree of 19Tau31, the 15 South Saros cycle of which this Lunar Eclipse is a part. And as you know, Venus-ruled Taurus is the sign of the physical body and of preservation and growth. Now because we're discussing the 6/12 axis and Full Moons (as Lunar Eclipses are) are always about relationships and awareness, perhaps a question could be: can the Sun (leaders) be saviors of a victimized public (Moon)? In Politics? Possibly yet there's an automatic problem since so much of how we're being victimized by Capitol Hill politicians is hidden within their self-serving theatrics. And crazy-train GOPers seem totally unwilling to accept or to act upon a realistic level. *See below for a quote from a famous writer who shares natally the Sun Libra-Moon Aries blend of energies of this Lunar Eclipse. The horoscope of the next Solar Eclipse in early November may be viewed here. Besides all that, the good news is that the Lunar Eclipse chart contains what may be the basis of a solution especially since the current Solar Eclipse theme is a release of tension: the T-Square created by the Sun-Moon opposition with its energies released through the 3rd house Jupiter in protective Cancer and which indicates 'success in joint ventures'. 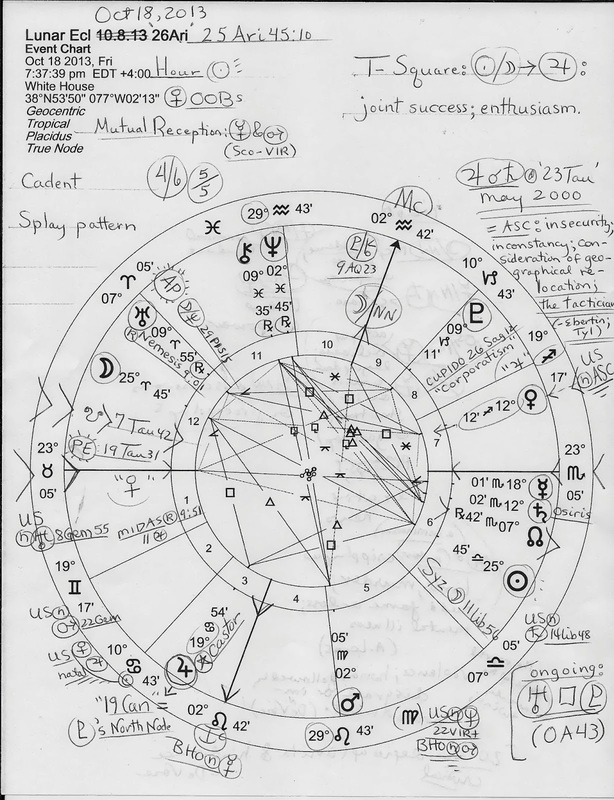 That Jupiter conjoins the North Node, a Jupiterian point of encounters, of Pluto (19/20 Cancer) shows mass destiny of large groups of people and gigantic projects that make lots of money. Naturally 3rd house Communications and Short Distance Travel are highlighted and will increase under benevolent Jupiter's rays which are aided by the Lunar Eclipse--either to reveal Jupiterian obstacles, both financial and ideological (which some prefer to keep hidden), or, by the T-Square forming an active system of inspiration concerning the vision of how good things could be. I believe we're already hearing President Obama and others doing just this as they promote the benefits of Obamacare which, if the program turns out to be successful, the president says will not be called 'Obamacare' for very long. And I'm certain you know why for you've seen the Contrarian Party in action ad nauseum, right? Now wouldn't it be helpful to the American people if the sore-loser Republican Party decided to actually govern and join in efforts to improve any glitches in what is already settled law? After all, if the Tea Party-led GOP is correct about how disastrous the insurance reforms of this law are, it will at some point soon be obvious. And if they are wrong, Obamacare will go the way of Social Security and Medicare and become a popular addition to American society and all the GOP belly-aching will be shown as the bad-faith campaign it really is. "A politician is an arse upon which everyone has sat except a man." Blog Note: if you've watched the new TV series, Sleepy Hollow, you may also wish to check out my post on it and view the natal horoscope of the story's original author, Washington Irving, America's very first international literary celebrity. And yes, Irving was indeed named after George Washington.